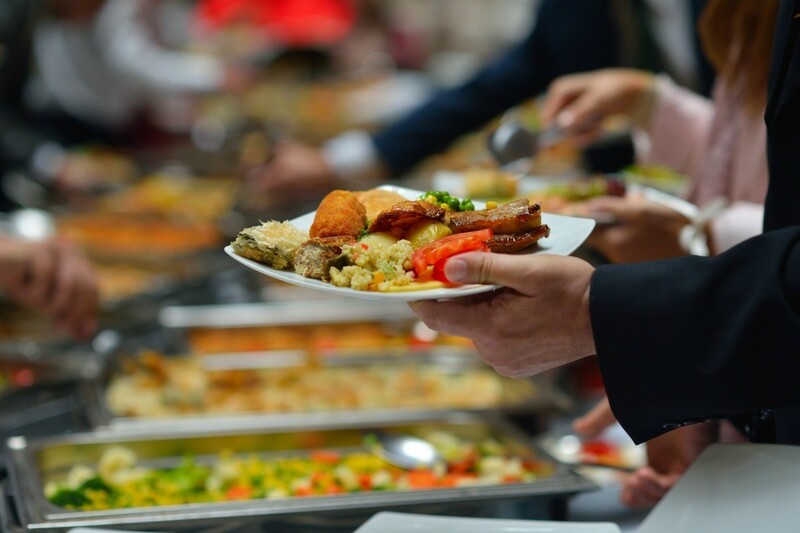 One way to keep within your wedding budget is to serve reasonably priced food at the reception. This is a guide about cheap wedding reception food ideas. My wedding is August 6, 2011 and I'm on a tight budget. I need to know what foods can I serve at the reception? I used to own a wedding catering business so I hope I can help you. I would serve little chicken salad sandwiches and before you say "yuck", do the following. Find a recipe for cream puffs and make tiny ones (approx 2") and instead of filling them up with cream filling, you will be slicing them in half and filling them with a chicken salad mixture using chopped/cooked chicken breasts, celery, chopped onions (optional) and whatever seasoning you might like. I have used eggs in the salad as well. Then you just use a tiny meatball scoop or Tbsp. to scoop into the cream puffs. Now for the punch. Go straight to your local ice cream plant or grocery store and get the largest 2 1/2 gal. of whatever sherbet you choose that will match your wedding colors. Then you mix that with either frozen pineapple juice and either 7-up or something similar. It ends up being like a frappe and is very yummy. I have even made variations to include almond flavoring or rum flavoring etc. You get the picture. The above things you can do ahead of time so you don't have to do it on the day before or so. You can freeze the cream puffs up to two weeks before the wedding and just take them out the morning of. Fill them as you use them so you won't have lots of soggie sandwiches to take home that you didn't use. That way you can refreeze the puffs and use whatever is left as a salad or in the puffs at a later date. I wish you the best and if I can be of any further help please let me know. I am looking for thrifty food ideas for a wedding reception. A lot will depend on the type of foods that you want. A lot of people do potluck receptions now. Why not just have cake, coffee, tea and punch. One type of ribbon sandwich that is pretty is to go to a bakery and special order bread made in a pretty color. I'm a big fan of the pasta bar. Get a big tray filled with bow tie pasta, and have a few sauces to choose from (heat up some jars of marinara, meat, and Alfredo and serve it all buffet-style from those big warming trays. Add a few huge bowls of salad, oil and vinegar dressing, and french bread. My husband's niece is getting married October 15, 2005, she has just informed her grandmother that she is going to take care of the reception. I still have all the decorations from my wedding so we will be using those, but we really need some cheap food ideas. As of now, I don't even know what time of day this wedding is supposed to be taking place. Please help! I did all the food for our wedding in 1987. I made ribbon sandwiches and tuna triangles, we had a veggie tray and a fruit tray and then bowls of regular potato chips. Then the cake of course. Ribbon sandwiches are done by going to the bakery and ordering ahead of time, fresh bread loaves and having them cut into 5 stripes horizontally. The top and bottom will be the crusts and those don't get used for the sandwiches. I fixed a little appetizer for one of my friend's daughter's wedding and it was very cheap and very good! All you need is a couple of loaves of party rye, spread a thin coat of cream cheese with a bit of dry ranch dressing stirred in, top with a thin slice of cucumber and sprinkle with a tiny bit of dill weed. This is a good little tidbit for either a winter wedding or summer one. You can also make little cream puffs ahead, freeze them, then the day of the reception, fill with tuna, chicken, and/or ham salads. Make cheese balls from cream cheese and onion, ranch dressing mix, Italian salad dressing mix, etc., and cover with the tube type of crescent roll dough. Be sure the cheese ball is well sealed in the dough, paint with beaten egg and bake till the dough is golden. I would spray the baking dish very well with Pam as egg can stick. When you cut into the ball, the cheese inside is nice and oooey-gooey! Just serve with crackers, etc. For the entree, try either lemon or five-spice chicken. Both of those are easily seasoned and baked during the wedding and ready to eat at the reception. If you are living in the Midwest, buy chicken at Aldi's. It is pretty inexpensive there. If you are having a large wedding reception, ask a small, local butcher if they can cut you a break if you get a quantity of one thing. Bake wontons in cupcake pan at 350 degrees F for 5 minutes or until golden brown. Brown sausage and drain. Add remaining ingredients and heat through until cheese is melted. Keep filler in warm container until ready to eat. A decorative basket can hold the wontons. Add sour cream for a topper. I just wanted to add that last fall I went to a low budget wedding and the food was great and cheap! They served pasta and salad, the couple went to a discount grocery store (Aldi) and bought pasta and sauce and everyone knows that pasta serves a lot and is relatively cheap for the quality. They had two kinds Alfredo and regular spaghetti type, they served it with a small salad and bread. It filled everyone up and they had cake! How about white beans and rice, jambalaya, or gumbo? (I'm from Louisiana, and we had white beans and rice and fried chicken as the main food at our wedding.) I think any of those can be pretty inexpensive and you can make a lot at once. Good luck! Also, try Sam's for cheap rolls, crackers, and dips. As I plan my wedding which is in 4 weeks, I plan on having a bit of Italy, pasta salads, crostini, w/ham and cheeses, (which is cheap and very easy, brushetta, (again, cheap and very easy! ) Breads, cheeses, and various pasta salads. Very cheap, easy to actually throw together for as many as you want. My mother is making a 9x13 cake for guests and we will only have a store bakery bought and lightly decorated cake that's a 2 layer w/ topper. Keeping it frugal, but elegant.